Beyond regular individual classroom projects, the Bihl Haus GO! Arts Program also organizes robust community projects, such as the 16 x 20 foot mural on canvas completed in 2013 for the Alicia Trevino Lopez Senior Center, in cooperation with the WellMed Charitable Foundation and the City of San Antonio Department of Human Services. It stimulated so much interest among GO! Arts participants at the WellMed Elvira Cisneros Senior Center that they asked to produce their own mural. We were offered a 60-foot uninterrupted wall in the recently renovated dining hall, an offer we could not refuse. Because of its sheer size, lead muralist Elizabeth Rodriguez proposed executing the mural in three phases, each section measuring 20 feet wide by 6 feet thigh. Each section is composed of thirty 2 x 2 foot individual canvases (90 total) that will be hung side-by-side to create one large cohesive composition. The theme of the mural is the Cisneros Center and the Southside, including especially the missions. The mural’s themes will have enduring appeal and will also celebrate San Antonio’s Tricentennial in 2018. The Phase I center section (“The Present,” on display here) will be completed this month. It will set the consistent tone, style and format for the two flanking sections of the mural. Phase II, “The Past,” will focus on pre-contact indigenous culture and historic mission life, followed by Phase III, “The Future.” Each section will be the backdrop to more personal stories shared by the artists who proudly live and/or grew up in the area. There will be 30-40 or more participants by the time the mural is complete. Each will share a fond memory or story, learn about the rich history of their part of town, be introduced to Mexican muralism, and experience the process of mural construction and collaboration. Students are learning how to use symbolism to say a lot with very little. The Alamo silhouette will frame the entire top of the mural. Military ribbons – San Antonio is “Military City USA” – will frame the two sides and the entire bottom, making it essentially one mural. 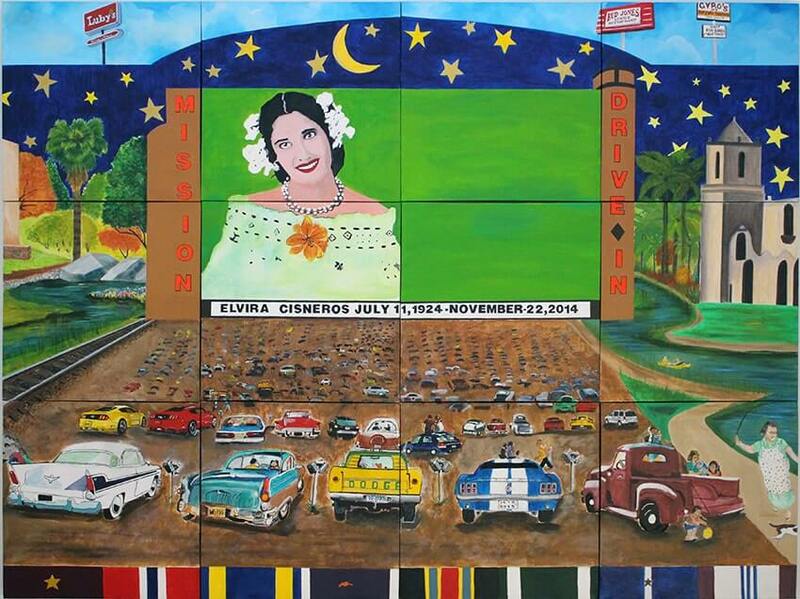 The Cisneros Tricentennial Mural is funded by the WellMed Charitable Foundation and Texas Commission on the Arts.